BISHKEK (KirTAG) — At the session of the Jogorku Kenesh, the deputies considered the issue of the election of a judge of the Supreme Court of the Kyrgyz Republic. Presidential Plenipotentiary in the Jogorku Kenesh, Kurmanbek Dyikanbaev, nominated Janyl Mambetali for election as judge of the Supreme Court of the Kyrgyz Republic. 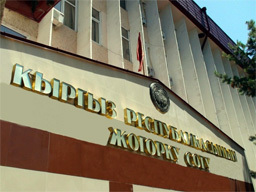 Previously, Mambetali was judge at the Bishkek City Court. During the discussion of this issue, the deputies outlined the problems in the sphere of the judicial system, in particular, the issues of ensuring the legality, the quality of the judiciary and judicial acts were raised. Following the discussion, the Jogorku Kenesh elected Zhanyl Mambetali as the judge of the Supreme Court of the Kyrgyz Republic. A corresponding decree of the parliament was adopted.